Nefertiti rose from obscurity to become the wife of a pharoah, co-founder of a religion, king maker and then virtually disappeared from history. The name Nefertiti means “the beautiful woman has come”. She is believed to have been the daughter of as army officer named Ay (but still was not confirmed), later a pharaoh himself, and his wife Tey. Ay, though born a commoner, rose through the ranks to become chief advisor to the pharaoh, Akhenaten. His beautiful daughter was noticed by the pharaoh and he took her for his Great Royal Wife or chief consort. 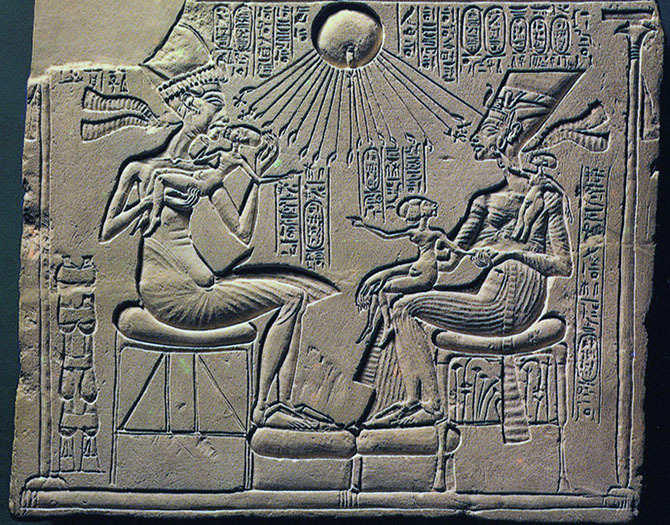 The exact date of Nefertiti’s marriage to Akhenaten (then known as Amenhotep IV) is believed to be about 1350 BC. They are known to have had six children around 1339 BC. The pharaoh also had a son by another wife, Kiya who would become the pharaoh Tutankhamun. In 1346 BC Amenhotep IV introduced the worship of the previously obscure god Aten, the name given to the sun-disk itself. 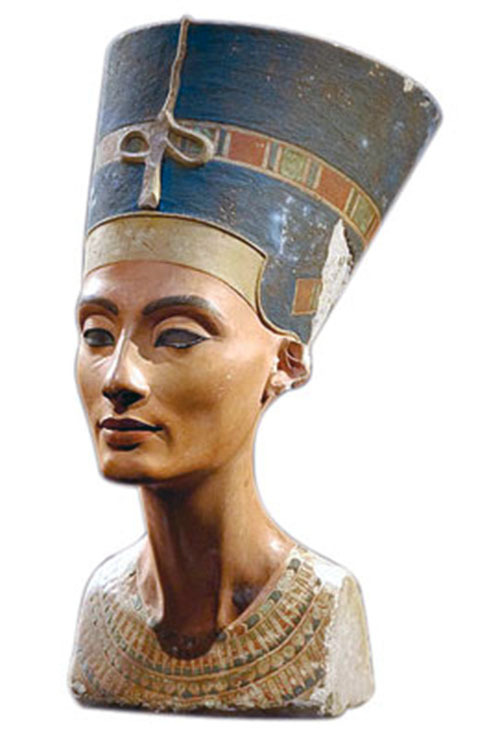 Nefertiti played a large role in this religious revolution. The pharaoh began the construction of a new capital city to be named in his honour and a year later changed his name to Akhenaten (‘effective spirit of Aten’) in honor of his god and proof of his fidelity to the deity. By Year 7 of his reign the new capital was nearing completion and the seat of power was moved from Thebes. Dedicated to the royal couples religion, the city of Akhenaten was completed in 1341 BC and contained some of the most massive temples of ancient Egypt. Nefertiti’s power had grown considerably over time. 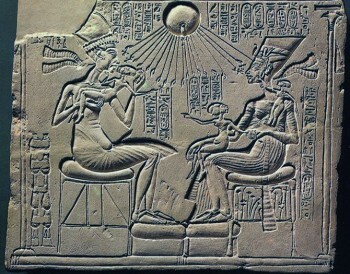 As co-regent with the pharaoh she is considered by many historians to be the most powerful woman on earth at the time. Small house stele of Amenhotep IV with his wife Nefertiti and children. Nefertiti’s rise to prominence may partly have been due to her husband’s obsession with Aten and his neglect of the affairs of state. Problems on the northern frontier at Canaan and wars among-st Egypt’s allies were largely ignored. A plague in the region finally resulted in the pharaoh sending troops to Canaan. The plague became a pandemic and resulted in many deaths in the new capital of Akhenatan and the belief that the gods had turned against the pharaoh. With the death of Akhenaten in 1334 or 1336 BC, Nefertiti succeeded to the throne. Her step-son, Tutankhmen was only 9 at the time and the queen took the name of Neferneferuaten. As pharaoh, Nefertiti is believed to have abandoned the Aten religion and moved the capital back to Thebes in order to curry favor with the people and powerful priests.She spent the time left to her educating her daughter now known as Ankhasunamun and step-son Tutankhamun in the old religion and preparing them to rule Egypt. There is a theory that Nefertiti was still alive during the early years of Tutankhamun’s reign and that she had considerable influence over him. Nefertiti mysteriously vanishes from historical records and is never mentioned again after 1336 BC. The most popular theory is that she died in the plague that was sweeping Egypt at the time. Her tomb in the Valley of the Kings was never completed and her body had not been found. She simply ceased to be a force in Egyptian history but her memory lives on in sculptures, reliefs and eulogies.